There are many beautiful timbers used for cladding buildings. In this second blog from our materials series, we explain why we have chosen Siberian Larch Timber over alternative species as the cladding for our MOSSpods. Siberian Larch (Larix sibirica) is a medium sized deciduous, coniferous tree from Siberian forests in Russia. The trees grow up to 40m tall with an average trunk diameter of 1m. An ideal tree for timber cladding will have a long, clean, cylindrical trunk for two thirds of its height. Siberian Larch therefore grows perfectly for milling into timber boarding. Siberian Larch is a very popular and versatile choice of timber for the external cladding of buildings because it is beautiful and has an excellent level of durability (Class 3 according to British Standards BS EN 350-2). Its durability is due to a combination of the naturally high density of the timber and resistance to decay and rot by a high natural non-reactive resin content. It is one of the toughest and most durable of the softwoods, more so than other softwood timbers such as spruce and cedar. It is known to have an outdoor lifetime exposure of up to 100 years. We have chosen Siberian Larch to be one of the primary timbers used in the construction of our MOSSpods for several reasons, not least because it is very attractive. With beautiful markings made by the growth rings, straight grain pattern and relatively few knots, the Larch boards are a soft and contemporary look for both the cladding and ceiling of our buildings. The Larch cladding boards are a mix of warm tones from reddish browns to golden hues. When weathered the colours are muted together into a silvery grey, which has a very practical benefit for the long life of the timber. When left untreated, the Larch naturally forms a protective layer, resulting in the silvering of the timber. If treated when newly applied, the life of the timber is compromised and dramatically increases the need for frequent maintenance. Best to leave it to age beautifully and naturally. The reason we source Siberian Larch instead of the European Larch grown in Britain is because the European Larch, unfortunately, isn’t good enough for machining into cladding profiles. There are many more knots in the pink coloured European cousin, which tend to fall out when the timber is drying out. Siberian Larch is of a much higher quality because it is subjected to longer winters and a higher altitude that slows its growth rate. Siberian Larch has a very high percentage of heartwood (up to 90%), which is very dense and not easily damaged. 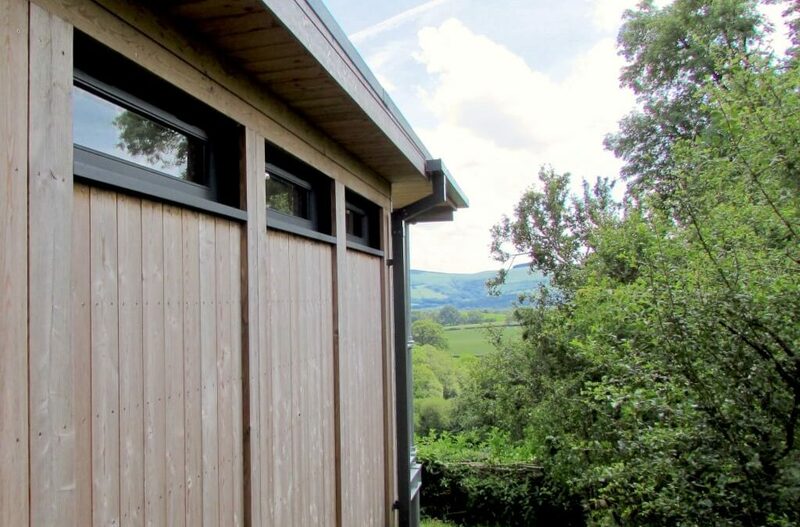 For external cladding, particularly on exposed elevations or areas of higher traffic this is ideal, as it limits knocks and scrapes that other timbers are more susceptible to. Over the years, we have found that standard tongue and groove profiles for cladding boards do not perform to a high enough standard as some don’t sufficiently allow for the natural movement of the timber. We therefore decided to develop a bespoke MOSS profile with our timber supplier, which allows considerably more movement between the boards as it shrinks, expands and twists over the seasons, resulting in a high-quality finish that stands the test of time. Working with Larch is a dream and the satisfaction of watching a whole wall clad with a regular rhythm of stainless steel screws is the crowning glory of each MOSSpod build.